Wine-buying truisms No842: Never trust a wine with a comedy name. That’s what they say. That and “never trust a wine with a novelty label” were lessons one and two of the grab-a-bottle-at-the-corner-shop wine course. I once bought a bottle of white wine that had a picture of a shark on the inside of the rear label that moved if you tilted the bottle from side to side. The inevitable truth was that if you tilted the bottle so much that it turned upside down, a totally horrendous liquid fell out. I’m not a fan of the recent explosion of “Keep Calm & Carry On”-themed merchandise, much as the original poster was an exemplary, understated piece of typographical design work. What does “keep calm and kill zombies” even mean? 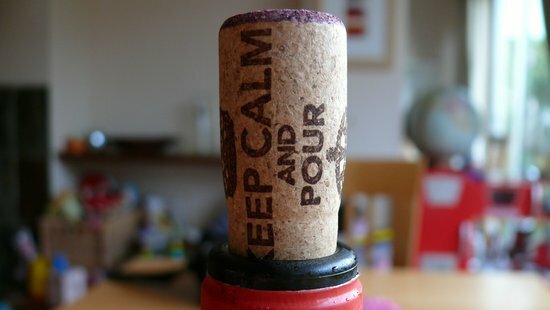 I don’t need to be ordered to “Keep calm and have a beer”, or “keep calm and go shopping”. It’s all useless brain mush. Of all of this infantile knock-off idiot-fodder, though, this is the best I’ve seen. It’s so much better than the rest, in fact, that I believe it’s actually good. 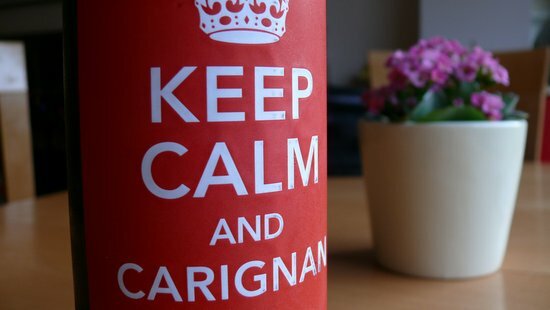 Keep Calm & Carignan is a pretty damn good play on words. Whoever came up with it has, I expect, been patted on the back so often and so heartily ever since that he or she is right now off work with a dislocated shoulder. On full pay. Though the cork, regretfully, ruins things a bit. Whoever came up for it works at Laithwaite’s, my second least favourite wine merchant (dislike based entirely on the way they sell wine, rather than the wine they sell, the very great majority of which I have no experience of at all). But even if the label is a joke, the wine isn’t: it comes from Fitou, smells of hot places, tastes of prunes and tar and liquorice, and is absolutely perfectly good. What’s more, it made very merry work of being drunk alongside some Turkish-style grilled meats. For £9.99 you might be paying a quid for someone’s clever idea, but they deserve it. Perhaps this will be the first of a series with names modelled on famous slogans and phrases. Just in case, here are some more ideas for you, Mr Laithwaite. They are my gift to you, feel free to use them*: Have a Break, Have a Muscat; A Marsanne a day helps you work, rest and play; Napa Crackle Pop; Happiness is a Cigales called Hamlet; No Chianti, No Comment; And all because the lady loves St-Peray; For a few dollars Mourvedre; Blaufrankischstein’s monster; It takes two Tarrango; Go to work on a vodka. *Though I may actually sue if you do.